The Federal Judiciary is, for self serving criminal REASONS, ignorant of the “sense and reason” of a reckonable Rule of Law and the Constitution of the United States. I apologize for my prior motion dated April 19, 2013. Please disregard it. I was too hasty in my submission. Emotions had driven me to forget that the Federal Judiciary is, for self serving criminal REASONS, ignorant of the "sense and reason" of a reckonable Rule of Law and the Constitution of the United States. This malicious ignorance is in spite of their professional responsibility and sworn oath, "that I will support and defend the Constitution of the United States against all enemies, foreign and domestic; that I will bear true faith and allegiance to the same." When I became homeless, 5 years ago, I wrote out my first Will and Testament. At that time, even as about to become homeless, I thought that I had assets worthy of note. Now as I approach the end of this 9 year criminal JUDICIAL action, I have nothing of note except this action that I now bequeath to my soul heir, Patrick Brandon Jeep. I will not be the first to have been pilloried and lynched by this criminal conspiracy on their gallows trap door of absolute immunity. Suffering inconsequential persons have been at the discretion of the absolutely immune for 10,000 years. Now "We the People" have been sold your corrupt, malicious, and incompetent bill of goods. And it may take another generation to see that absolute immunity quashes the idea of reckonable inalienable rights and a constitutionally limited Government… a reckonable Supreme Law of the Land. Your reference, for my heir's sake, to a fixed dollar amount of damages is in error, it is an escalating amount e.g., as of Friday April 19, 2013 - 12:12 PM the amount is $208,114,000.00. As to your assertion that the admittedly large list of respondents is delusional, I would ask, if you deny this motion, please add your name as an additional CRIMINAL respondent. 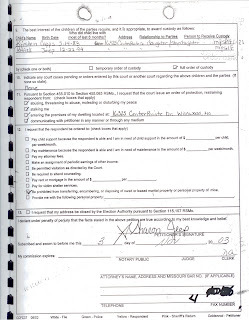 Everyone on the complaint as listed respondents has, at one time or another had the issue's criminally unashamed "deprivation of any rights, privileges, or immunities secured by the Constitution and laws" presented to them and per statute as government actors tasked with Justice and or enforcement of rights under color of law they "shall be liable to the party injured in an action at law, suit in equity, or other proper proceeding for redress." People have been, since at least 1871, and continue to be pilloried and lynched by the CRIMINAL judicial assertion of absolute immunity. "Immunity is given to crime, and the records of the public tribunals are searched in vain for any evidence of effective redress." "The courts are in many instances under the control of those who are wholly inimical to the impartial administration of law and equity." I say it NOW, Sunday, April 21, 2013!!! Justice William O. Douglas said it in 1961 and 1967. Mr. Lowe of Kansas and Mr. Rainey of South Carolina respectively said it originally in 1871. I take exception to your attempt to discredit my complaint by saying that I am "a frequent litigant before this court." I would describe myself as an unfortunate frequent repeated VICTIM before this corrupt, malicious, dishonest, incompetent and CRIMINAL court as I clearly and UNASHAMEDLY assert in the listed respondents to this complaint. From the very beginning, I have had the uncontested PROOF of the criminal judicial officer's criminal denial of rights, this court and others have REPEATEDLY conspired to refuse to see it. Now additionally I list all the Local, State and Federal Governments as liable also. We the People, as individual person incorporated with each other to establish Justice and secure the Blessings of liberty. My government as a corporate entity has clearly had a hand in this deprivation facilitated at the hands of the individual persons listed as government actors and respondents. Neither Judge Goeke, nor Commissioner Jones had Jurisdiction. The essential requirement for any Government action is reasonable "probable cause." 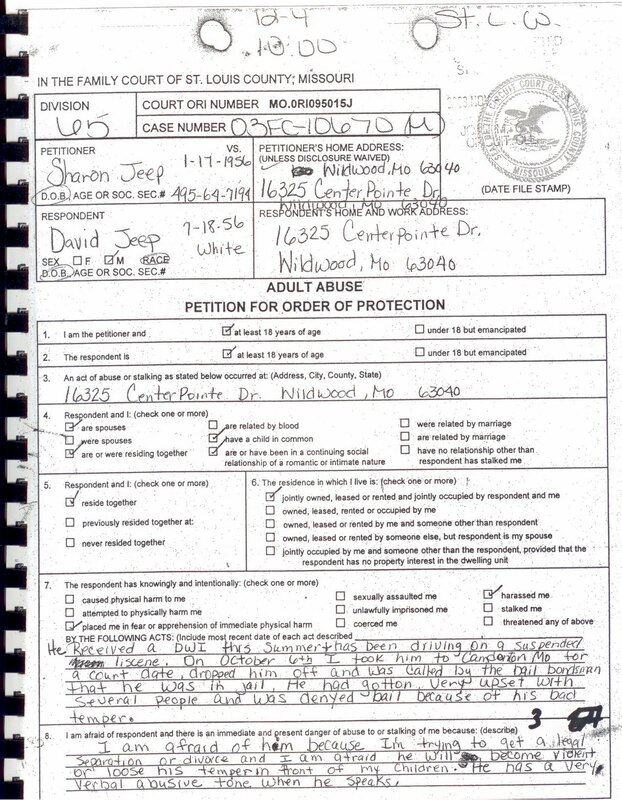 On its face the original petition, from the now respondent, did not have REASONABLE constitutional probable cause for the asserted violation of the Missouri Revised Statutes Protective Orders Section 455.035 thus the two Judicial Officers had a "complete absence of jurisdiction" and Penn v. U.S. 335 F.3d 786, 789 (8th Cir. 2003) does not preclude this complaint. Constitutionally and statutorily Jurisdiction requires reasonable probable cause; see 4th, 5th, and 14th Amendments to the Constitution for the United States and Missouri Revised Statutes Protective Orders Section 455.035. I was held to answer a warrant that lacked reasonable probable cause shown on its face in the petition. Not only was the original petition, a violation statutorily and constitutionally, it defies logic to ask someone to answer a charge without specific reasonable probable cause. How do you logically answer a charge without probable cause? I did not do what I am not accused of? This is, WAS and has been a violation of my constitutional right and the protection of the Law, see 4th, 5th, and 14th Amendments to the Constitution for the United States and Missouri Revised Statutes Protective Orders Section 455.035. This ongoing violation creates ever escalating damages. 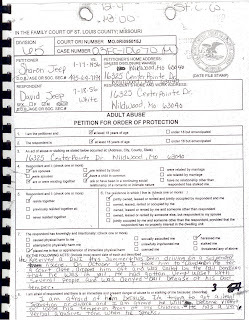 The only listed probable cause on the original handwritten petition for an ex parte order of protection was a misdemeanor traffic violation from a different geographic jurisdiction and a different subject matter jurisdiction, at that time prior, under the asserted UNRELATED judicial officer's jurisdiction (it should be noted that the Judicial officer in question on misdemeanor recused himself for his bad act) . That two geographic and subject matter jurisdictionally unrelated issues are linked together as one goes further to establish the over all UNREASONABLENESS and thus its jurisdictional criminal constitutional violation. Now if you could somehow get past the constitutional requirement for REASONABLE probable cause, which you can not. The 8th Amendment's requirement that "nor cruel and unusual punishments inflicted" for an alleged, later disproven, misdemeanor traffic violation precludes the imposed punishment, the deprivation of my home, my son, my paternity and my liberty. The Rule of Law, as described by Chief Justice John Marshal in Marbury v. Madison, the seminal Supreme Court case said, "The Government of the United States has been emphatically termed a government of laws, and not of men. It will certainly cease to deserve this high appellation if the laws furnish no remedy for the violation of a vested legal right." The Founding Fathers, the Authors of the constitution, had lived for too long at the discretion of the Nobility's absolute immunity with "no remedy for the violation of a vested legal right" and sought to establish a reckonable Rule of Law to replace the Rule of the Nobility's absolute immune prerogative. The Rule of Law is meaningless if the ubiquitous absolute immunity that empowered the Rule of the Nobility in pre-revolutionary times, is allowed to circumvent the Rule of Law. The Rule of Law is therefore, by definition, irreconcilably opposed to absolute immunity. There can be no Rule of Law if the law can be circumvented by absolute immunity. I again humbly ask you to reconsider your error, We the People incorporated ourselves into a government to "establish Justice" and "secure the Blessings of Liberty to ourselves and our Posterity" in "all Cases, in Law and Equity, arising under this Constitution, the Laws of the United States, and Treaties made, or which shall be made, under their Authority." Post Civil War we backed that up with the more explicit Federal Statute Law that deliberately nullified any prior common law assertions with first Criminal 18, U.S.C, § 241 & 242 and then Civil 42 U.S.C. § 1983 and 1985. To assert absolute immunity for the "malicious or corrupt" judges, the "malicious or dishonest" prosecutor, the "knowingly false testimony by police officers" and any malicious, corrupt, dishonest and incompetent actions by "all persons -- governmental or otherwise -- who were integral parts of the judicial process" acting under color of law is completely without reason. As regards your assertion Kahn v. Kahn, 21 F.3d 859, 861 (8th Cir. 1994) I have to ask who in their RIGHT mind would give up their Constitutional Civil Rights in any case, but much more importantly when the dispute revolves around not only your own life, liberty or property but that of your heir's life, liberty or property. Kahn v. Kahn is an open example of your disregard for the intrinsic requirement of your oath to "support and defend the Constitution of the United States against all enemies, foreign and domestic." Clearly to any reckonable reading of the 14th Amendment requirement "No State shall make or enforce any law which shall abridge the privileges or immunities of citizens of the United States; nor shall any State deprive any person of life, liberty, or property, without due process of law; nor deny to any person within its jurisdiction the equal protection of the laws," Kahn v. Kahn can not hold when there is a deprivation of "life, liberty, or property, without due process of law" and "equal protection of the laws." As to your assertion that I am only complaining because I did not like the outcome, I agree 100%. If you had violated my rights and I had been awarded all that I seek, I would NOT be here right now. That is a little too obvious for serious consideration as an argument against my complaint. a. "Spreadsheet of escalating damages dated Friday April 19, 2013 - 12:12 PM the amount is $208,114,000.00"
b. "Copy handwritten ORIGINAL petition dated November 3, 2003"
"Nothing need be said to illustrate the importance of the prohibition of titles of nobility (i.e., absolute immunity). This may truly be denominated the corner-stone of republican government; for so long as they are excluded, there can never be serious danger that the government will be any other than that of the people." You somehow want to argue that "the grant of Nobility" was about something other than the ROYAL Status of IMMUNITY. You want to argue that hereditary property rights were linked to a Colonial interpretation of Nobility? That would undermine Free-Enterprise. Anyone that wants to assert "the prohibition of titles of nobility' was meant to be anything more than a prohibition of the absolute immunity of the nobility had been allowed, need only read the Petition of Right 1628 and note the consistent aversion to the asserted immunity of the nobility. There is not now and there was not then any titular value other than Royal status as immunity - being above the law? Did Nat "King" Cole violate the constitution? No one is that petty. Nobility conferred ONE-THING of interest now and then, IMMUNITY from the RULE OF LAW!!!!!!!!!!!!! To assume that Congress, which had enacted a criminal sanction directed against state judicial officials… ibid. Missouri Revised Statutes Chapter 455… ibid..
 Missouri Revised Statutes Chapter 455… ibid. Revised "A humble pro se EMERGENCY PETITION for a WRIT OF CERTIORARI, 9.34 years of deprivation, IN THE SUPREME COURT OF THE UNITED STATES, 27 pages, dated Wednesday, September 26, 2012" – A FAILURE to COMMUNICATE!!!!! I regret to inform you that you have WORK to do! Neither the "Rules of the Supreme Court of the United States" (effective February 16, 2010) or Office of the Clerk's "GUIDE FOR PROSPECTIVE INDIGENT PETITIONERS FOR WRITS OF CERTIORARI" (dated October 2012) are at issue here. I complied with those rules, as I have SEVERAL times before with my original submission and revised petition as referenced above. I admit on the original submission there was a typographical error as to the properly brought case from the lower court, Eight Circuit Court of Appeals Case 12-2435. I corrected that with the revised petition dated Wednesday, September 26, 2012 First-Class Mail® Delivered October 02, 2012, 10:51 am, WASHINGTON, DC 20543 Certified Mail™ (#70121010000144212589) and never acknowledged by the Clerk's Office. It is available as submitted on my blog (at http://dgjeep.blogspot.com/2012/09/revised-humble-pro-se-emergency.html). I would resend it here, but alas I am indigent and without the basic necessities of life i.e., food and clothing and thus unable to afford the added postage. Beyond that I assert the "sense and reason" of Gideon v. Wainwright, 372 U.S. 335 (1963) and my repeatedly confirmed indigent Pro-Se status; I am as the DIRECT result of the corruption, malice and incompetence ubiquitous within this issue unable to financially acquire Professional Representation. You and your corrupt, malicious dishonest and incompetent co-conspirators know the proverbial deck has been stacked against the constitutional intent, "sense and reason" to "establish Justice" and "secure the Blessings of Liberty to ourselves and our Posterity" in "all Cases, in Law and Equity, arising under this Constitution, the Laws of the United States, and Treaties made, or which shall be made, under their Authority" and statute law Title Civil 42 U.S.C. § 1983 and 1985, Title Criminal 18, U.S.C, § 241 & 242 by the Supreme Court's malicious, corrupt, incompetent and ubiquitous grant of ABSOLUTE POWER using ABSOLUTE IMMUNITY for the "malicious or corrupt" judges, the "malicious or dishonest" prosecutor, the "knowingly false testimony by police officers" and any malicious, corrupt, dishonest and incompetent actions by "all persons -- governmental or otherwise -- who were integral parts of the judicial process" acting under color of law to wit, ABSOLUTE CORRUPTION. Now the Supreme Court's self-serving assertions have been allowed to stand as law. But precedent does not make law. There is a difference! The Constitution REQUIRES that ALL civil disputes be submitted to a 7th Amendment Jury. I include by reference here my letters dated Friday, January 4, 2013 to Gail Johnson, Clerk of the Court and Monday, March 18, 2013 to Andrew Downs, Clerk of the Court, both delivered First-Class Mail® Certified Mail™. 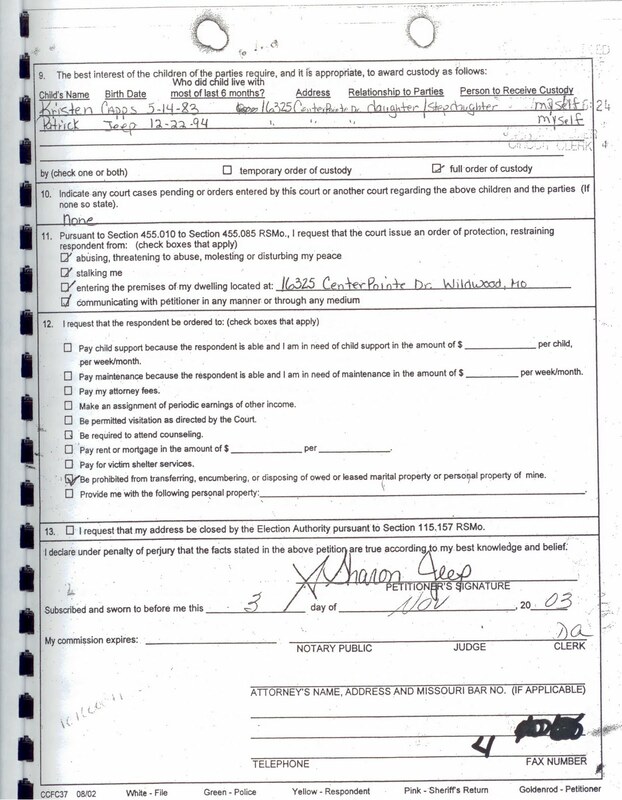 Gideon's ORIGINAL handwritten pro-se indigent petition was not in compliance with the "Rules of the Supreme Court of the United States." Regardless of the Courts decision, the courts consideration of Gideon's issue set precedent for the blanket unimpeachable requirements of the "Rules of the Supreme Court of the United States." There are not constitutionally sanctioned titles of nobility in this country and while it seems trivial even to me, somehow your ilk has derived ABSOLUTE POWER using ABSOLUTE IMMUNITY for the "malicious or corrupt" judges, the "malicious or dishonest" prosecutor, the "knowingly false testimony by police officers" and any malicious, corrupt, dishonest and incompetent actions by "all persons -- governmental or otherwise -- who were integral parts of the judicial process" acting under color of law to wit, ABSOLUTE CORRUPTION. Your reference, for my heir's sake, to the dollar amount of damages is an escalating amount e.g., as of Friday April 19 2013 12:12 PM the amount is $208,114,000.00. And if you deny this motion, please add your name as a respondent. I ask you to reconsider your error, We the People incorporated ourselves into a government to "establish Justice" and "secure the Blessings of Liberty to ourselves and our Posterity" in "all Cases, in Law and Equity, arising under this Constitution, the Laws of the United States, and Treaties made, or which shall be made, under their Authority." Just Post Civil War we backed that up with the more explicit Federal Statute Law that expressly nullified any prior common law assertions with Title Civil 42 U.S.C. § 1983 and 1985, Title Criminal 18, U.S.C, § 241 & 242. To assert absolute immunity for the "malicious or corrupt" judges, the "malicious or dishonest" prosecutor, the "knowingly false testimony by police officers" and any malicious, corrupt, dishonest and incompetent actions by "all persons -- governmental or otherwise -- who were integral parts of the judicial process" acting under color of law is completely without reason. As regards your assertion Kahn v. Kahn, 21 F.3d 859, 861 (8th Cir. 1994) I have to ask who in their RIGHT mind would give up their Constitutional Civil Rights in any case, but much more importantly when the dispute revolves around not only your own life, liberty or property but that or your heirs life, liberty or property. Kahn v. Kahn is an open example of your disregard for the intrinsic requirement of your oath "support and defend the Constitution of the United States against all enemies, foreign and domestic." Clearly to any reckonable reading of the 14th Amendment requirement "No State shall make or enforce any law which shall abridge the privileges or immunities of citizens of the United States; nor shall any State deprive any person of life, liberty, or property, without due process of law; nor deny to any person within its jurisdiction the equal protection of the laws," Kahn v. Kahn can not hold when there is a deprivation of "life, liberty, or property, without due process of law" and "equal protection of the laws." I very much appreciate the administration's NOT blaming anyone for the bombing. To put a face on the terror is to give it to much authority. I would prefer to let the TERRORIST go free rather than be forced by the omini-present fear of another Al-Qaeda further into a prison of irrational FEAR!!!!!!! The terrorist win when they force us to live in FEAR. I just finished reading Jared Diamond's "The World until Yesterday: What Can We Learn from Traditional Societies?" He asserts and I agree, we need to rethink how we judge fear. We are toooo afraid of inconsequential things and to unaware of the TRUE dangers. Traditional people that actually live with REAL fear are much better actuarials than those of us that rely on the so called NEWS MEDIA. Terrorist in today's modern world may account for 100 deaths a year world wide, to counter that fear we unreasonably give up our civil rights to privacy, We give up our rights to enter our public buildings without having to open purses and back pack, we give up the right to get on a plane without invasive x-rays and taking off our STINKY shoes. It is insanity. We are sacrificing our hard won CIVIL RIGHTS for unreasonable FEARS!!!!! We do not need more erosion of our CIVIL RIGHTS. An inept "shoe bomber" incompetently merely attempts to blow himself up on an air plane and NOW everybody getting on an airplane has to take off their shoes!!!! It is insanity. If Al-Qaeda had actually wanted to blow somebody up, if Al-Qaeda had actually had suicide bombers, they would have been boarding air planes after having swallowed the packets of explosive, just like drug smugglers do. No Al-Qaeda wanted to scare us into TAKING off our shoes, upsetting our lives with irrational FEAR. We have take control of the war on TERROR by not giving into the TERRORIST FEAR MONGERS. We have take control of the war on TERROR by not giving into the TERRORIST FEAR MONGERS. We have to stand up for SANITY in the face of irrationalism. If you walk around St. Louis, I would think like most American cities, you are metal detected, wanded or x-rayed at every TURN!!!!! You can't go anywhere with a back pack and not be asked to disorder everything in it for the sake of a warrantless SEARCH for the right to enter virtually any public building!! To my knowledge there has never been any bombing in St. Louis, MO. As sure as I say that someone is going to attempt a bombing in St. Louis. That still DOES not mean we have to all walk in FEAR. "No one can terrorize a whole nation, unless we are all his accomplices." "We will not be driven by fear into an age of unreason, if we dig deep in our history and our doctrine, and remember that we are not descended from fearful men…"
The FEAR MONGERS in this country, that hold PUBLIC OFFICE; want us afraid, they want us to be wiling to go to war at the drop of their proverbial "hat" for their power, personal enrichment and vendetta. We need to stop the fear. We need to reach out to those that would be our enemies with Justice. A justice that will prosecute the perpetrators to full extent of the law but not PERSECUTE anyone!!!!! Admittedly the Jane Crow era of rampant deprivation of RIGHTS is relatively new as compared to its predecessor the Jim Crow era. I have referenced "To Kill a Mocking Bird, The Denial of Due Process," in several of my papers. I do so only because the admittedly fictionalized facts of the case in "To Kill a Mocking Bird" are generally known but not without standing Jane Crow era. If the Sheriff Tate had investigated the accusations of Mayella Ewel, he would have seen them for the racially motivated baseless accusation against a crippled man of good character that they were. How could the crippled Tom Robinson been able to do the things he was accused of? If Horace Gilmer the prosecuting attorney had actually looked at the evidence Atticus presented instead of blindly pushing the perjured racially biased testimony of the Ewels he would have offered to dismiss the charges. If Judge Taylor had any of the altruistic, supposedly independent, courage that our judiciary is based on, he would have dismissed the charge as vexatious or calumnious so as not to offend the Ends of Justice that should have been his PRIMARY motivation. "Immunity is given to crime, and the records of the public tribunals are searched in vain for any evidence of effective redress." "The courts are in many instances under the control of those who are wholly inimical to the impartial administration of law and equity." I say it NOW, Tuesday, April 16, 2013!!! Justice William O. Douglas said it in 1961 and 1967. Mr. Lowe of Kansas and Mr. Rainey of South Carolina respectively said it originally in 1871.